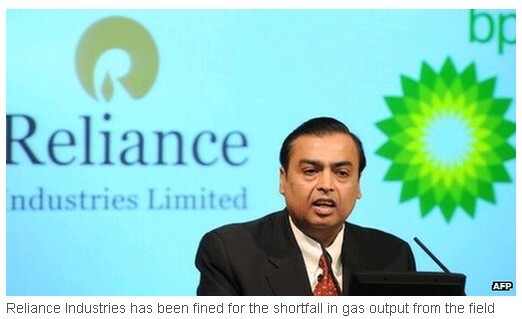 India's Reliance Industries, UK oil giant BP and Canada's Niko have filed an arbitration notice against the Indian government over gas prices. The firms operate India biggest natural gas field, KG-D6, and had won an approval to nearly double their prices. But the implementation of that move was deferred by India's election watchdog ahead of the ongoing general elections. The firms said the delay in increasing the prices was impacting their plans to develop the field. The companies said in a statement over the weekend that without clarity on when the prices will rise, they "are unable to sanction" planned investments of close to $4bn (￡2.4bn) this year. "In addition, this will also delay the ability of the parties to appraise and develop other significant discoveries made last year." The discovery of the KG-D6 field in 2002 was hailed as India's largest offshore gas find. In 2007, India's government - which sets domestic gas prices - had approved a price of $4.2 per million metric British thermal units (BTU) of gas from the field for the first five years of production. It started production on 1 April 2009 and therefore that price expired on 31 March 2014. The new pricing mechanism was debated for nearly two years and was a hot political topic in India. The government finally approved a price of $8 per million metric BTU in 2013. Meanwhile, gas output from the block has fallen since 2010. For its part, Reliance - which has a 60% stake in the field - has said the fall was due to the geological complexity of the block. However, the government has alleged the firm did not meet its projections and has fined Reliance $1.7bn for the shortfall. Over the weekend, the three firms issued a joint statement saying they have been "working diligently to arrest the decline from currently producing fields". They said there was 5 trillion cubic feet of discovered gas resources in the block that "await investment and development to be able to bring them to market". "As we have stated before, these resources need clarity on long term gas prices to be developed economically." BP bought a 30% stake in the field for $7.2bn in 2011.